I am delighted to have our experiences of my dad’s dementia featured as a case study in this hugely important book that explores young onset dementia. 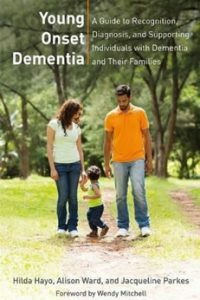 The book is a guide to recognition, diagnosis and supporting individuals with dementia and their families. ‘Young onset dementia’ is written by Hilda Hayo, Alison Ward and Jacqueline Parkes, and published by Jessica Kingsley Publishers (JKP). Our case study begins on page 109 in Chapter 5, ‘The impact of young onset dementia on family relationships’. You can find out more about ‘Young Onset Dementia’ on the JKP website: https://www.jkp.com/uk/young-onset-dementia-2.html. Many thanks to Alison Ward for interviewing me and including our case study in this book.